Global Managed Security Service Market is expected to grow from US$ 24.05 Bn in 2017 to US$ 47.65 Bn by 2026, at a CAGR of 8.92% during the forecast period. 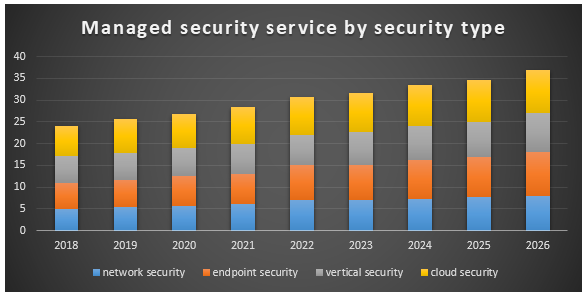 Managed Security Service market is segmented by Security Type, organization size, deployment Mode, vertical, and region. On the basis of Security Type, the market further classified into managed network security, managed endpoint security, managed vertical security, and managed cloud security. In terms of organization size the market is divided into large enterprises & SMEs. Based on deployment Mode the market is split into on-premises, and cloud. Vertical segment includes Banking, Financial Services, And Insurance (BFSI)), Government and Defense, telecom and IT, healthcare, energy and utilities, manufacturing, retail. According to the region market is spread into North America, Europe, Asia pacific, Middle East & Africa, and Latin America. It is necessary to have a managed security system which is massively available in market today. Rising factor about Managed Security Service market is that they can provide accuracy in internal and external scans among IT network, web verticals, hosts, and databases. Scans by an MSS will reduce the resource needs through a structured distributed deployment, so it is helping to reduce costs from IT operations. Risk of cyber-attacks on all the business and organization has been increasing day by day, it may harm organization’s personal information and sensitive data. High initial cost is limiting the growth of market. In terms of region, Managed Security Service market is segmented by North America, Europe, Asia pacific, Middle East & Africa, and Latin America. North America is estimated to grow at high rate in Managed Security Service market owing to large-scale industrialization and different organizations emerging in the region. Increasing strictness of cyber security regulations and government support for the development and commercialization of advanced security are boosting the market in this region. Key players operated in managed securities service market are IBM, SecureWorks, BT group, AT&T, verizon, Trustwave, Symantec, Wipro, alertLogic, Symantec, bae Systems, centurylink, DXC, fortinet, fujitsu, NTT Security, Accenture, cipher, HCL, Hitachi systems security, optiv security,rapid7, Unisys. Global Cloud Migration Services Market – Global Industry Analysis and Forecast (2017-2026) by Service Type, Deployment Model, Application, Vertical and by Geography.